You guys. This has been a long time coming! 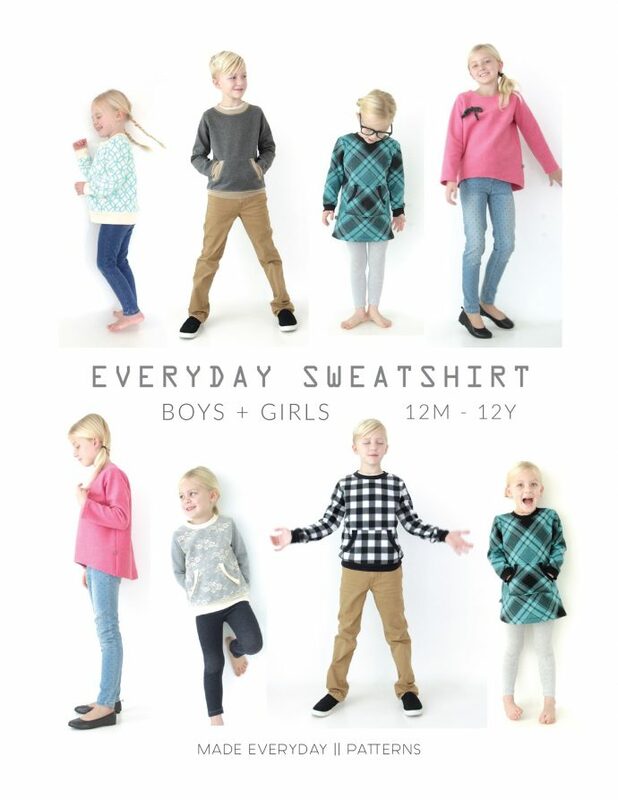 But I’m SO excited to finally announce that the Everyday Sweatshirt Pattern has arrived! We’ll show you how to turn cozy piles of this, into…. kangaroo pocket, high low, tunic length, and optional puffed sleeves. 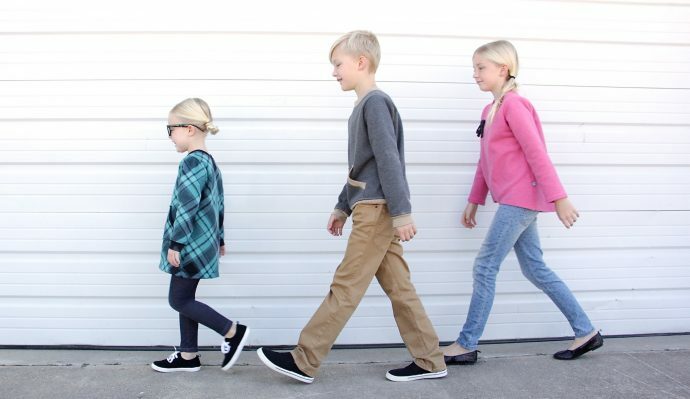 It’s the perfect cold weather staple for your boys AND girls, babies AND tweens. There are 11 Sizes and 5 Styles. You’ll find all the info HERE in the SHOP. The High-Low version is really one of the reasons I wanted to create this pattern. I love the look of a high-low hemline! 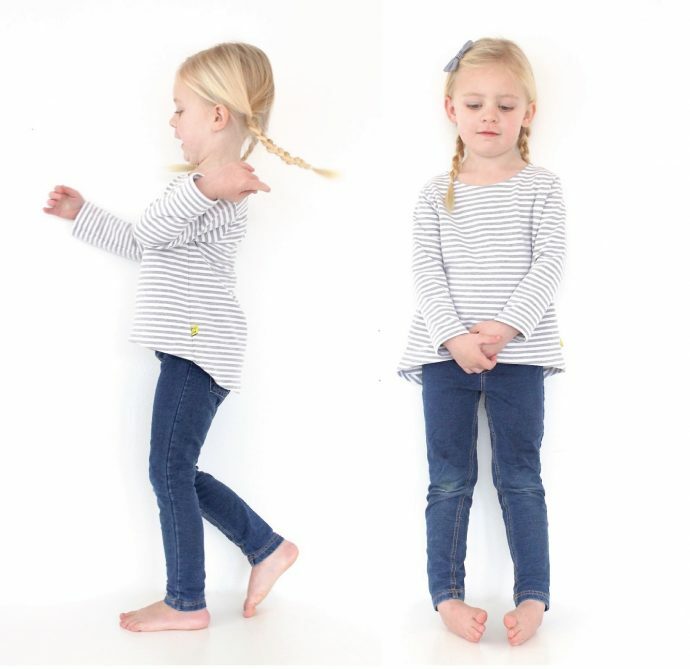 size range – 12 months to 12 years. And finally, I had to throw in another couple fun options. The tunic length is perfect for leggings (or you could even extend it a few more inches for a little dress). 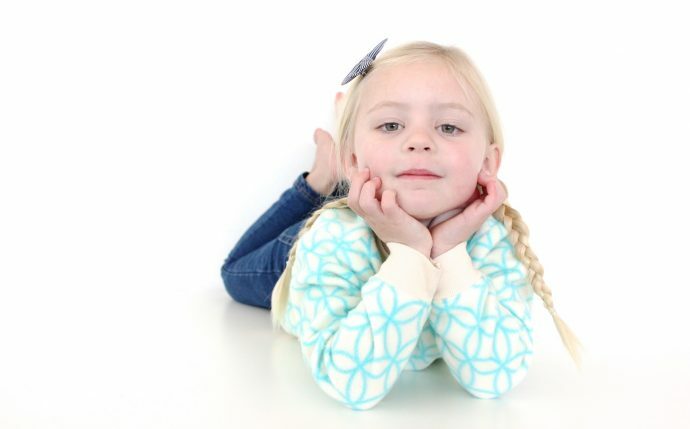 And for just a tiny added effort, the puffed sleeves add an adorable little girly touch. 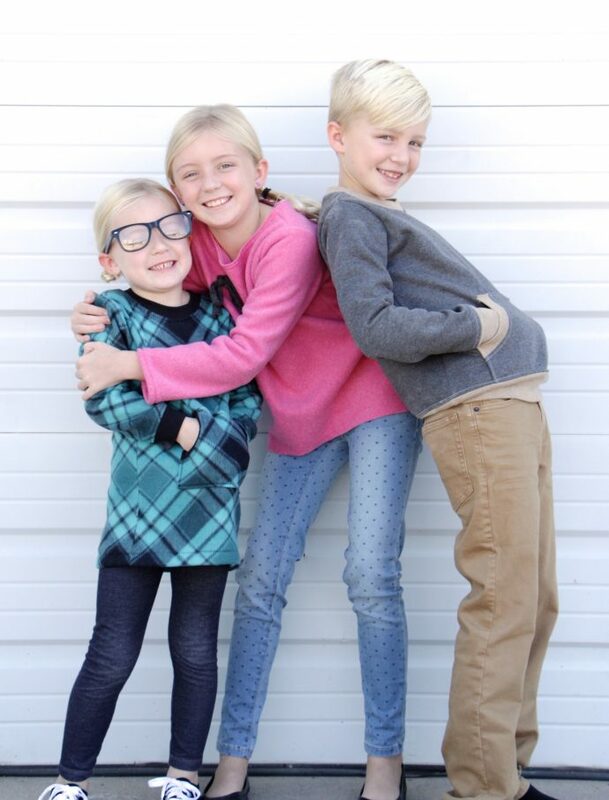 I have no idea why, but Clara has decided that glasses are her new favorite accessory for photoshoots. But I completely approve. Whatever style you choose, it’s going to be a party. And if you’ve been subscribing to our newsletter…. You know that we announced and released this pattern yesterday to you guys! That’s right, another high five for reading our newsletter. Plus, we gave away FIVE FREE PATTERNS to newsletter readers as well. So subscribe to our newsletter over there in the right-hand column. 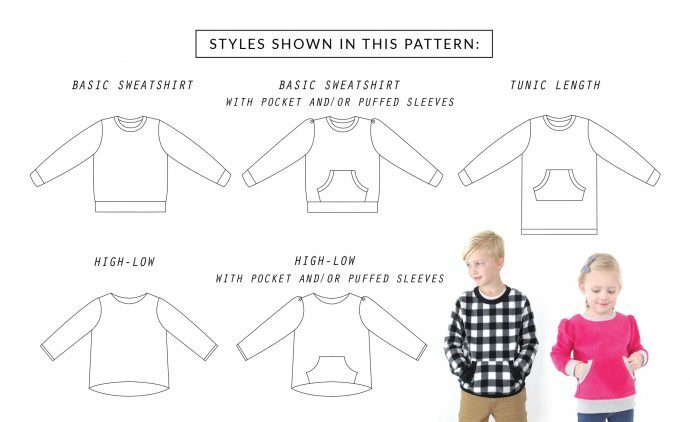 When you’re ready to sew your Everyday Sweatshirt, we’ve also created a HEADQUARTERS page—-with additional links, fabric info, tips, FAQs, and other tutorials. This will be an ongoing resource page that grows over time. So check that out as well. Now move those little fingers over to the SHOP! Happy Sweatshirt Sewing my friends. Yay!!! I’ve been so excited about this pattern ever since you put the call out for pattern testers!! Can’t wait to try it!!!! It’s adorable, Dana! I know you’ve been working on this one for a while – congrats on the release!! Are you going to make a youtube video on how to make a sweatshirt? Yes! I hope to do some videos about making a sweatshirt. It’s high on my list. love it. i only have one negative thing to say. it’s WAY to little for me. I live in very hot south Texas and a novic sewer. Love the sweatshirts but wondering if I could just sew these without using sweatheshirt material or did I miss that answer already? Sure! You can sew them with lightweight knits as well. It will give the sweatshirt a more loose/flowy shirt kind of look. But that’s really cute too. Hi! 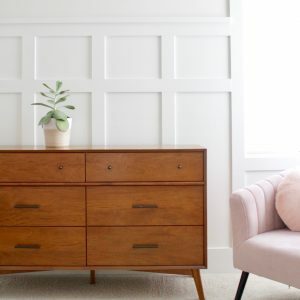 Your patterns are so inspiring and easy to use. (How helpful that they are BOTH those things!) I made my kids robes four years ago, and I -still- hear, quite frequently after a bath, “Thanks so much for making us these robes, Mama.” Real deal. The sweatshirt is fabulous, but …I’m missing the hoodie! I’m sure you thought this through, but do you have any suggestions for working this in? I’d actually love to make a knight’s costume, and was hoping this pattern would do the trick, but I need a cool chain mail hood, of course. Thanks so much. Truly appreciative. I actually made this pattern intentionally without the hood. In fact, I talk about that in the first paragraph of the pattern. Haha. This is meant to be a classic sweatshirt, worn as a pull-over, or as a shirt, or dressed up a bit with the high-low version. While I love the look of a hood, I found that hoods were always getting in the way with my kids, in their younger ages—in the carseat, etc. My kids were annoyed by them. So that’s why this pattern is hoodless. would love o see a video on this that is what inspires me to make things as you usually show easy ways to tackle them. 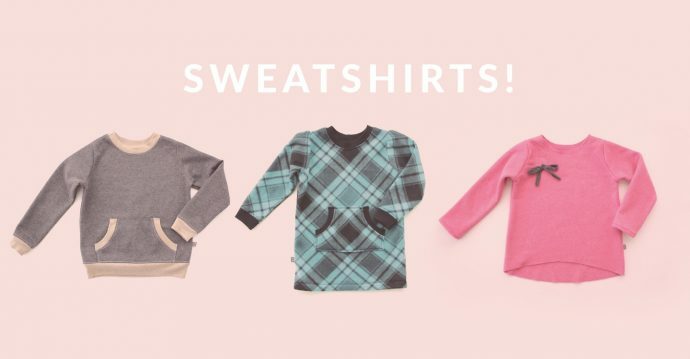 Hi there, my granddaughter barely stops twirling in her skirts to have them washed, so I am very eager to give the sweatshirts a whirl. I am however, a novice seamstress. Will I be tearing out my hair as often as I tear out seams? 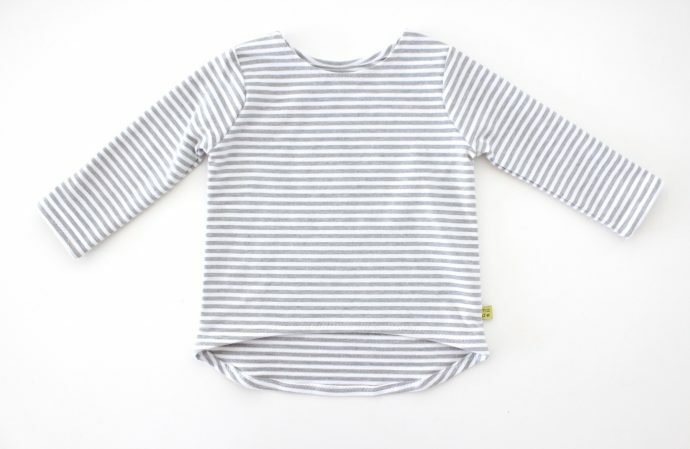 This is an AWESOME project for beginner, if you’d like to learn how to sew with knits! 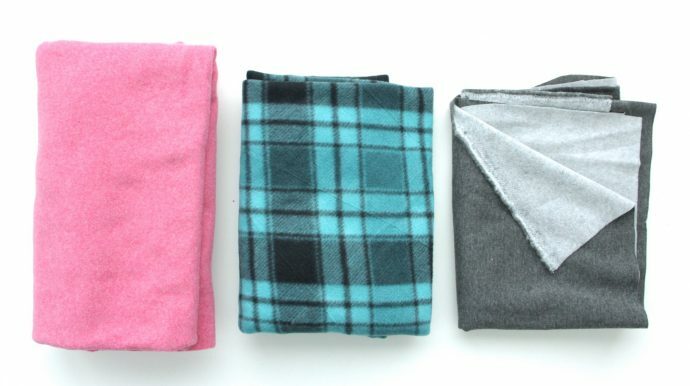 Fleece is easy to work with….and it’s so inexpensive that if you have any trouble the first time, it’s easy to start a second one. Yes, you can make this with a standard machine! Just use a zigzag stitch, as outlined in the pattern. 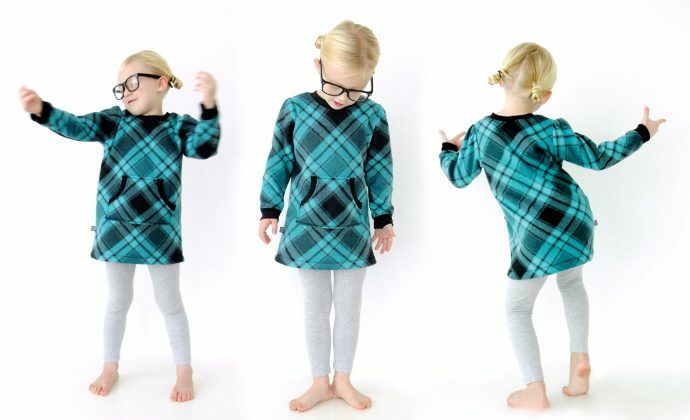 This is a great beginner sewing project! Since people constantly ask for Atikluk patterns, If you don’t mind, I’m going to send them this way for a really great pattern that’s very similar. (I don’t make patterns, I literally just cut and sew, that’s how we were taught). So, even if you didn’t mean to perpetuate the Inupiaq Eskimo culture, you are! Thank you! Are you going to make a video on how to sew this sweatshirt? I’m 10 years old and I would love to so this as well as the felt cookies and boy shirts with characters on it! Will you be making videos on these thing? Thanks! P.S. You are amazing at sewing and I look up to you! I got the pattern as soon as it came out, but I don’t seem to be able to print it! I’m European so I print on A4 size paper. What is your original papersize? Also, have you heard from other’s on this side of the ocean struggling or is it just me (and the printer at my office 😉 ) The test square comes out at 90%…. Would that matter a lot? Would really like to make one soon! Hi Roxane – the patterns are formatted to US letter size, which is 8.5 inches wide by 11 tall. They can be printed on other paper sizes, but you do want to make sure the scale is correct. 90% could matter a lot, yes. I recommend adjusting the print scale until the test square is accurate. Hi there so I tried sewing your lined zipper pouch,I love it there so fun to sew and cool looking I had lots of fun sewing them. I love your skirts too their cute. 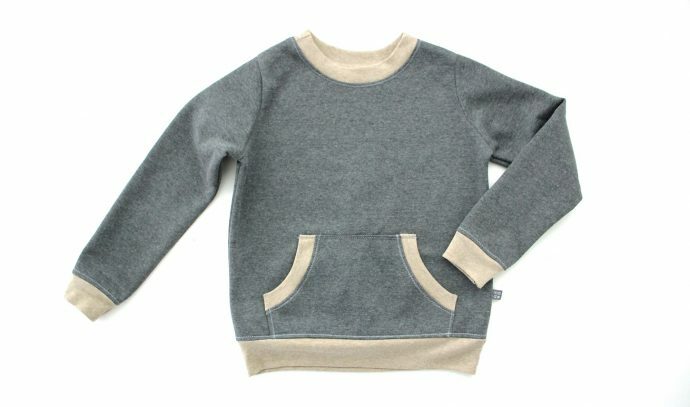 The Everyday Sweatshirt was a fun project to make for my 4 yr old grandson. I used heavier weight anti-pill aqua fleece for the main fabric and primary yellow for the pocket. All the ribbing was gray. It turned out great and he loved it. Sooo cute! The size 5 fit him well though I made it a couple inches longer than the patter called for. The directions with pictures made it come together easy for my mid level sewing ability. 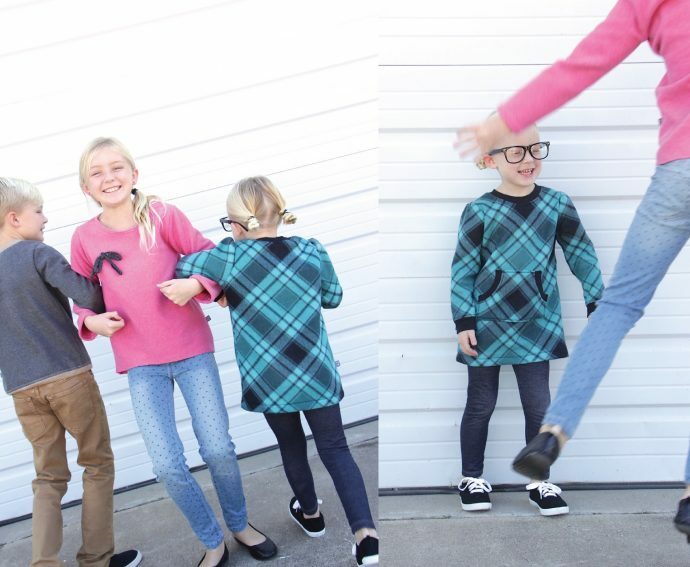 More Everyday Sweatshirts will be on the sewing list for next winter. Thank you for a great pattern with very easy to follow instructions.